The Lightning Bolt, The Tachikara Prince, and The Fritzafraniac are "havin' fun" on August 4th in Saratoga Springs, NY at the Eagles Club. Rick and Fritz toast some Jagermeister with their friends Kimberly Bott and Don Clark, as Don was celebrating his birthday on August 4th at FPB's gig in Saratoga Springs, NY. 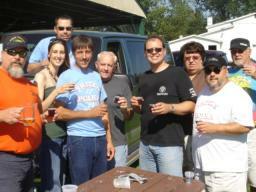 Rick, Tom, Fritz toast some Jagermeister with their friends, Kimberly Bott and Don Clark on August 4, 2007 at the Eagles Club in Saratoga Springs, NY. Tom and Frank are shown here cranking out a tune on August 4th at the Eagles Club. Rick, Frank, and Gabe jam along at FPB's afternoon gig at the Eagles Club in Saratoga Springs, NY on August 4th. 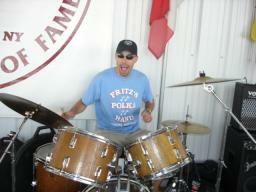 Fritz is pictured here during FPB's gig at the Eagles Club on August 4th. 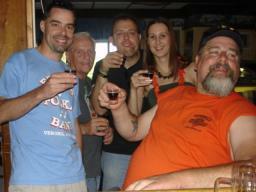 Members of FPB are shown having a toast of Jagermeister punch with their friends (L-R) Don, Kimberly, Fran and Charlie during FPB's gig at the Eagles Club in Saratoga Springs, NY on August 4, 2007. 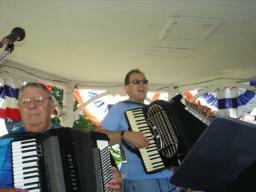 Fred and Fritz are pictured here playing a tune during FPB's morning gig at the Old Home Days in Vernon Center, NY on August 4th. Fred with his Excelsior during FPB's gig on August 2, 2007 at the International Boxing Hall of Fame in Canastota, NY. Gabe with his Parker bass on August 2, 2007 in Canastota, NY. Fritz is pictured here in action on August 2nd in Canastota, NY, along with Frank and Rick (both partially hidden). 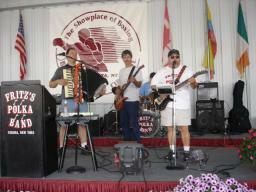 Fritz, Frank, Rick (partially hidden) and Gabe are shown here during FPB's gig at the International Boxing Hall of Fame in Canastota, NY on August 2, 2007. An up close shot of Frank with his "ax" during FPB's gig at the International Boxing Hall of Fame on August 2nd. Rick is shown here during FPB's gig on August 2nd at the International Boxing Hall of Fame.